Two big questions hang over President Obama's radical "Green Jobs Czar" Van Jones. Is he still a communist? Is he a security threat? Many have assumed that Van Jones' committment to communism ended when the organization he helped to lead STORM (Standing Together to Organize a Revolutionary Movement) dissolved in 2002. Most former STORM members are still active in San Francisco or New York. The STORM created or staffed organisations Ella Baker Center for Human Rights, POWER, SOUL, FIERCE, War Times and Women of Color Resource Center all all going strong and are still receiving mega-bucks from multiple left wing foundations. All these organizations are still networked with former STORM associates such as Harmony Goldberg, Raquel Lavina, Maria Poblet, Adam Gold, Cindy Wiesner, Jason Negron-Gonzales, Mei-ying Williams or Steve Williams active in one group while serving on the board of another. Most former Bay Area STORMers are working closely with cadre from the Communist Party USA offshoot Committees of Correspondence for Democracy and Socialism (CCDS). Van Jones himself has long worked with people from the CCDS orbit including Betita Martinez, Roxanne Dunbar-Ortiz, Linda Burnham, Max Elbaum, Felicia Gustin and Bob Wing. In February 2006, just over three years after STORM folded and just over three years before being appointed to his White House position, Van Jones was keynote speaker at a Committees of Correspondence fundraiser in Berkeley. The second annual CCDS and Kendra Alexander Foundation Banquet will take place on Sunday, February 19 at the Redwood Gardens community room in Berkeley with Van Jones, a pioneering human rights activist known as a steadfast opponent of police brutality and mass incarceration, as keynote speaker. Jones is now working to create environmentally friendly, "green-collar" jobs for formerly incarcerated persons. The banquet is titled "Towards Building a Progressive Majority" and benefits the Committees of Correspondence for Democracy and Socialism and the Kendra Alexander Foundation. The Foundation was named in honor of the visionary leader of the Committees of Correspondence. Maybe Jones didn't realise he was addressing a Marxist-Leninist function? Maybe he thought it was a Rotary or PTA group? Of even more concern are the close ties between STORM , the Bay Area CCDS, foreign communists and Cuba. 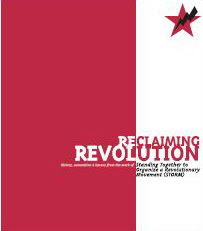 According to "Reclaiming Revolution" page 37 several STORM members traveled to Cuba in 1999 as part of the notorious Venceremos Brigades. As STORM seldom exceeded 20 members, it is very likely that Van Jones, as a leader of the organisation was on that, or another, Cuba trip. Surely a good question for some enterprising journalist? Three STORM leaders also travelled to South Africa in 1998 for the South African Communist Party conference. It is woth remembering that the Venceremos Brigades were founded in 1969 by Students for a Democratic Society radicals Carl Davidson and Tom Hayden. Incidentally Hayden and Davidson were two of the five founders of a new organization in 2008-Progressives for Obama. Davidson has a personal history with Obama when they worked together in the Chicago New Party and in anti Iraq War activism. STORM associate Mei-ying Ho traveled to Cuba with the 2004 Venceremos Brigade. Now married to another STORM associate Steve Williams, Mei-ying Williams is involved with the Women of Color Resource Center where she works with Linda Burnham and well known radical and CCDS leader Angela Davis. Steve Williams, who has been to South Africa, Cuba and Venezuela, now runs POWER-People Organized to Win Employment Rights. He worked on the organizing committee of anti Iraq War magazine War Times with Van Jones, Betita Martinez, Linda Burnham, Max Elbaum, Felicia Gustin, Bob Wing and Adam Gold in the early 2000s. In July 2009 Steve Williams represented POWER at the CCDS National Convention in San Francisco. The panel featured responses to the "Democracy Charter" by Bill Fletcher, Jr., editor of Black Commentator, Michael Eisenscher of US Labor Against the War, Jacqueline Cabasso from Western States Legal Foundation, Frank del Campo from the Labor Council for Latin American Advancement, and Steve Williams of People Organized to Win Employment Rights. Bill Fletcher, Jr. cast the Charter as a political and social guide for mass struggle." Jacqueline Cabasso is a Communist Party USA supporter, Bill Fletcher Jr is with Democratic Socialists of America and was with Davidson and Tom Hayden one of the five key founders of Progressives for Obama. 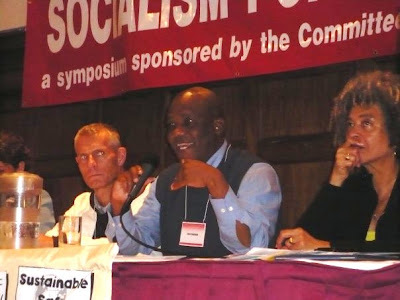 Helmut Scholz of Die Linke, Germany; Chris Matlhako of the Communist Party of South Africa, and Angela Davis of CCDS. Carl Davidson is of course also a big fan and promoter of Van Jones' work. 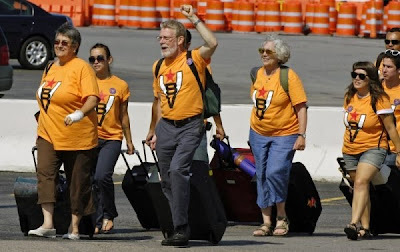 Van Jones associates Linda Burnham, Bob Wing ,Betita Martinez, Roxanne Dunbar-Ortiz, Linda Burnham, Max Elbaum, and Bob Wing are all veterans of the Venceremos Brigades or multiple trips to former East Bloc countries. Another close ally, Roxanne Dunbar Ortiz , worked in Cuba with the Venceremos Brigades and with other revolutionaries including the Students for a Democratic Society and its terrorist offshoot the Weather Underground. She also worked in London in the 1960s with the South African Communist Party controlled African National Congress. Not to mention over a hundred trips to Nicaragua, mainly in Sandinista times. There is also another Cuban connection that is possibly even more concerning. When Van Jones ran the Ella Baker Center for Human Rights, the organization was very close to another Bay Area institution-DataCenter. Founded by Jon Frappier, a former supporter of the Weather Underground Organization, Datacenter is essentially the intelligence hub of the US left. The Oakland California based organisation provides strategic information & research training to communities advocating for dignity, justice & civil rights." Incredibly DataCenter also admits to being an "information" gatherer for Cuban "institutions". DataCenter's ties to Jones' Ella Baker Center are close. Diana Frappier who helped Jones establish and run the Center is believed to be a relative of Jon Frappier. Celina Ramirez worked as a Policy Director at the Ella Baker Center for Human Rights, 2006 and in 2006-2007 served on the DataCenter board. This is the environment Van Jones sprang from. These are his "roots". Has Jones abandoned the values he held and the people he worked with up until a few months ago just because he now has more power, money and influence? Working in the White House is (or should be) a high security job. Van Jones now has access to all sorts of high level information and gossip. He has President Obama's ear on economic and social matters that could dramatically effect the US economy and eventually US military power and security. Let's just hope Van Jones has abandoned his core convictions and past associations in last 6 months shall we? After all the Obama White House claims to have extensively vetted all appointments-so he must be OK. Your site is one of my favorites seen around blog explosion. Does anyone know if monkeyboy has stopped wetting the bed yet? On Friday last week there was a pdf version available on the web, today it is not available, and I can find no sites (like Amazon) to purchase it on the web. I really liked your post on home financing! if you have more information elsewhere let me know. Please come visit my site Corpus Christi Business Directory when you got time. Yeah it is a great and nice article looking forward to have such article it is so useful. Please come visit my site Plano Yellow Page Business Directory when you got time. what news organizations in the US have read this blog? You mention Bill Fletcher, Jr. as editor of Black Commentator and with Democratic Socialists of America. He works at a much deeper level within the extreme left in the US. He’s perhaps the most public member of Freedom Road Socialist Organization – freedomroad.org (try searching his name on their website). FRSO is Maoist and supports violent revolution and a separate independent homeland for blacks within the boundaries of the current US. FRSO has worked quietly within the larger ‘progressive’ movement by infiltrating left leaning organizations. They try to control the direction of the movement behind the scenes. Fletcher was one of the founders of Progressives for Obama. Thanks Chuck-I think we have talked before? Perhaps we should talk again.